Charly is a padded seat that stands out for its unexpected design that enhances the primary elements that compose it – seat, armrests, backrest, headrest – joined by a light and elegant tubular structure, which is either chrome-plated or satinized in precious metallic tones. An unconventional seat with unstructured aesthetics, Charly is the king of modularity: as a matter of fact, it surprises because of the numerous combinations that it offers, in terms of configurations – the abacus of modules is rich in variations, but also of fabrics and colors that can be chosen and combined for the different elements. Essential geometric shapes, as well as round and enveloping lines, define the design of a seat with an ironic and revolutionary mood. Production lead times are often flexible and stock levels vary. Please inquire for current availability. Materials: Wooden body, polyurethane foam padding, fabric covering Dimensions: 90 x 120 x 75 cm. 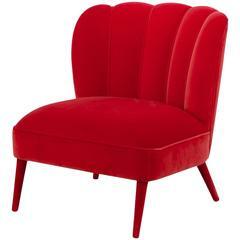 Armchair red dragon in red velvet and fully upholstered. Ideal for lounge and living. Rare antique charred or burnt oak tablet armchair with wicker seat. Solid, sturdy construction with great patina. 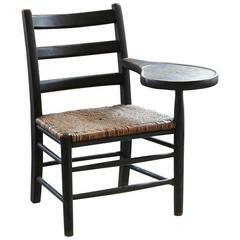 The wicker seating is double layered from top and bottom. Armchair with wood structure filled with expanded elastic polyurethane and Dacron. Painted wood feet. Cover in leather.